Intermediate downtrend for the TSX Index. Reference the last chart analysis. 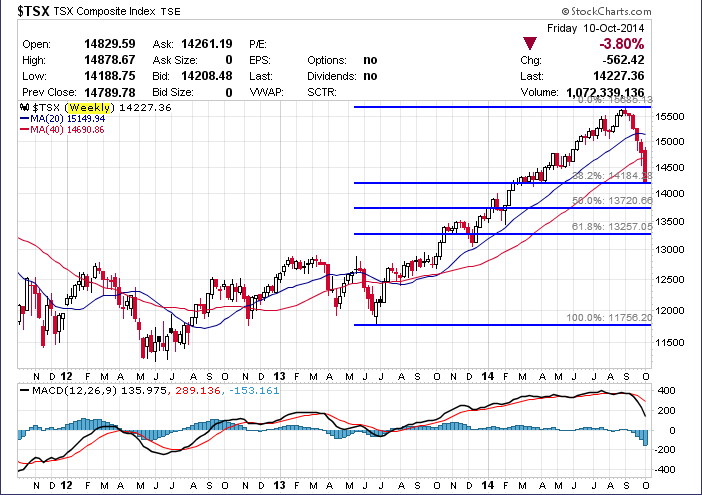 This entry was posted in TSX Index and tagged candlestick chart, retracement, TSX on October 12, 2014 by Trader. Major uptrend still in effect for the S&P 500. But how long more will it last? There is a high probability the S&P 500 will test the trendline which is the 200-day simple moving average. This entry was posted in U.S. Indexes and tagged chart analysis, logarithmic chart, retracement, S&P 500, Technical Analysis, trendline on July 31, 2014 by Trader. 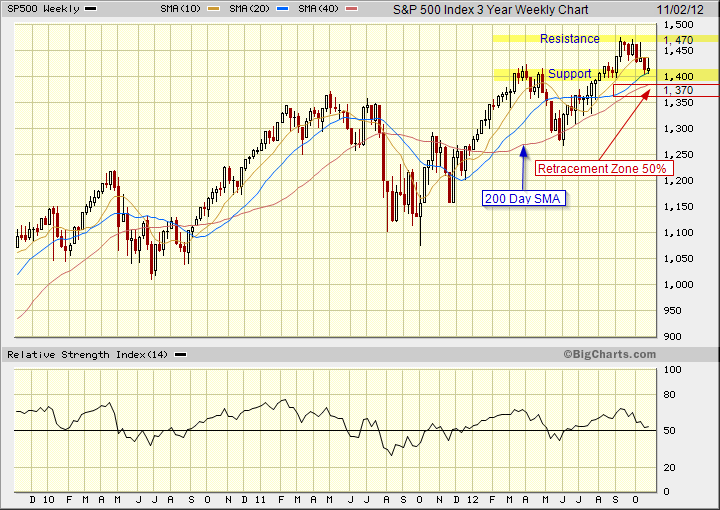 Reference the last chart analysis for the S&P 500 Index based on the daily chart. 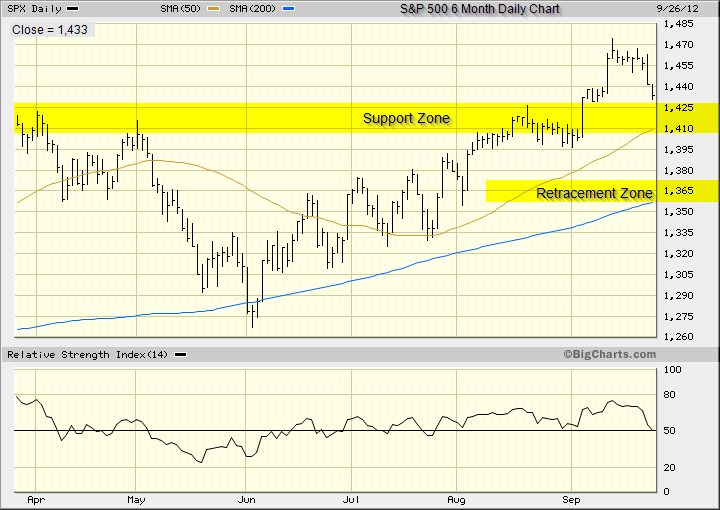 This entry was posted in U.S. Indexes and tagged resistance, retracement, S&P 500, support on November 2, 2012 by Trader. What is the trend? That is the most important point to determine in technical analysis and you always trade in the direction of the trend. The major trend is up, the intermediate trend is up and the near-term trend is down. The S&P 500 Index has gained around 16% from the June low for the current intermediate uptrend. Anytime an index or stock has gained around 20%, reversal signals on the charts take on greater significance. Trading is all about the assessing the probabilities. The intermediate uptrend is still intact but the near-term downtrend must stop at the intermediate support zone. This support zone is around 1,420 which was a resistance point in the uptrend. The reversal of roles is an important concept in technical analysis. Also, the support zone is around the 50-day simple moving average which is always an important input in automated trading systems. And, the support zone is at the intersection of the upward sloping trendline. The retracement zone is based on the 50% retracement of the move which started in June. Also, the retracement zone is near the 200-day simple moving average which is also an important input in automated trading systems. In summary, always trade in the direction of the the intermediate trend until there is a confirmed break of the trendline. Traders use different time and percent levels for confirmation numbers. This entry was posted in U.S. Indexes and tagged resistance, retracement, S&P 500, support on September 26, 2012 by Trader. Reference my last chart analysis for the Dow Jones Industrial Average. 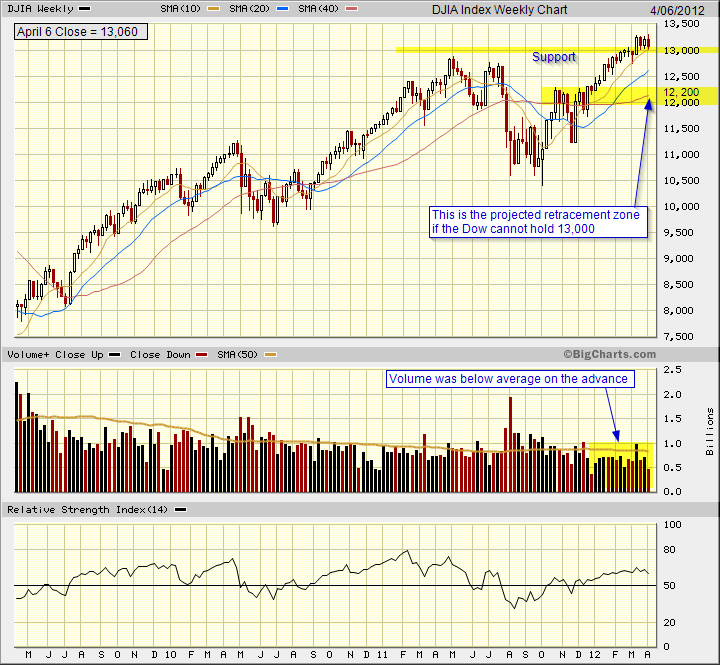 This entry was posted in U.S. Indexes and tagged DJIA, retracement, support on April 6, 2012 by Trader. 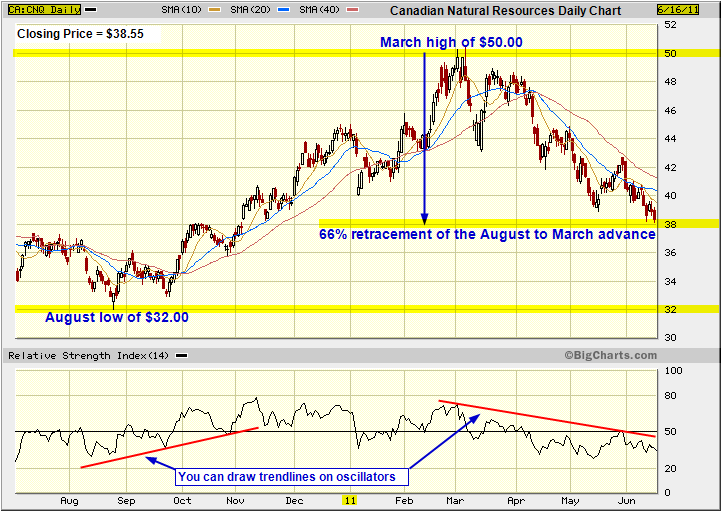 If it does not hold $38.00, CNQ could retrace the whole prior move to $32.00. Reference the updated chart analysis for CNQ published on November 4, 2011. Reference the previous analysis for CNQ. This entry was posted in Stocks and tagged chart analysis, CNQ, retracement, RSI on June 17, 2011 by Trader. There are no firm rules when an index or stock retraces a prior move. The minimum retracement level would be 33% and the maximum would be 66%. If the correction passes the 66% level, there is a high probability the stock or index will retrace the prior move. The 50-day moving average is a good approximation of the trend line. The major trend ( longer than six months) is up. The intermediate trend ( three weeks to three months) is up. The near-term trend ( less than three weeks) is now up. The March correction was a 34.3% retracement of the July to March upswing. The March correction was -7.7%. The support level of 13,500 held on the pullback. 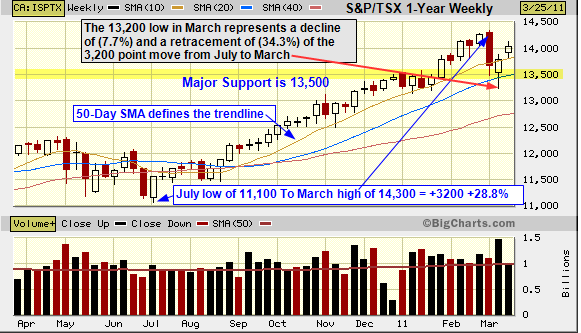 You can reference recent chart analysis of the S&P/TSX index to see where the index made an assault on the 13, 500 level. Then there was the break and the run to the March high. This two-year annotated candlestick chart of the TSX makes one statement: it was a good run. Maintain a neutral trading strategy at this juncture in the S&P/TSX index with alerts at the 14,200 and the 13,800 levels. A close above 14,200 would be a possible indicator to add to long positions as the index attempts a break through the recent high of 14,300. A close below 13,800 would be a possible indicator to liquidate some long positions as you monitor major support at 13,500. This entry was posted in TSX Index and tagged candlestick charts, retracement, TSX on March 28, 2011 by Trader.